If you need a nice ride in the beautiful city Nanjing, just simply contact us now to get our BEST QUOTES and GREATEST SERVICES today! Car rental serivice provider in Nanjing city China ! We drive your way in Nanjing! 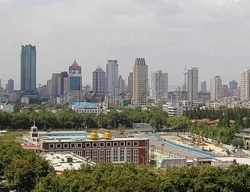 Nanjing is located in Yangtze River Delta economic zone,the capital city of Jiangsu Province,it has always been one of China's most important cities. It served as the capital of China during several historical periods and is one of the Four Great Ancient Capitals of China. The city will host the 2014 Summer Youth Olympics. Nanjing is one of the most beautiful cities of mainland China with lush green parks, natural scenic lakes, small mountains, historical buildings & monuments, relics. The highlights include: Zijin Mountain, the Mausoleum of Sun Yat-Sen, Confucius Temple, Mingxiaoling Mausoleum, Qinhuai River, the Memorial Hall to the Victims in the Nanjing Massacre, Linggu Temple, the Presidential Palace and Mochou Lake,which attracts thousands of tourists every year. Nanjing is a modern city with energetic economics. Pillar industries such as high-tech electronic information, auto industry, petrochemical industry ,iron and steel industry have built a strong basis of Nanjng’s industry and formed a complete industrial system. Nanjing is also an important manufacturing base. Besides, the advantage of developing modern service industry is obvious—five big regional service centers have been formed in the field of modern logistics, tourism exhibition, finance, information and trade. Shanghai Car Rental Service will be very honored to have the opportunity to serve you in Nanjing with our great limousine services, we will insure a hassle-free, most comfortable trip no matter you are traveling Nanjing for official business visits or personal tourists. All our drivers are from local and they are all licensed, well trained and with more than 6 years’ experience in serving our foreign customers, they are also quite familiar with the routes in Nanjing and other cites in Jiangsu province and can easily drive you wherever you want. ◆Nanjing Lukou airport transfer services ,hotel pick up and drop off . ◆Long-term car lease for individuals or cooperates in Nanjing.